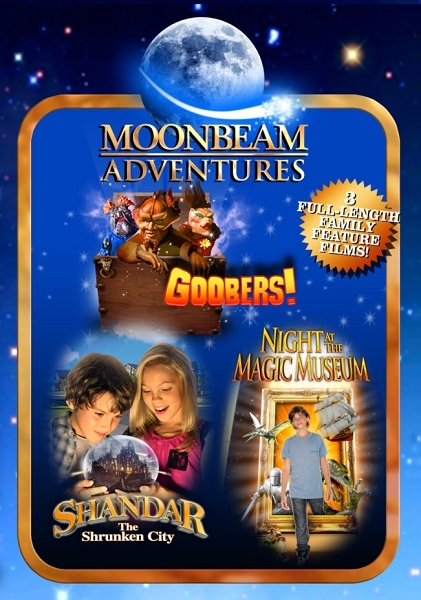 This new collection includes Shandar: The Shrunken City, Night at the Magic Museum*, and Goobers! All three DVDs come together in a special, space-saving slimline DVD case. *Note: Night at the Magic Museum was also released as Mysterious Museum. Two kids, GEORGE and LORI - have literally discovered a new world. Hidden deep underground for centuries, the tiny bottled city of Shandar is unearthed in an excavation site. Damaged from the dig, the dormant, miniaturized metropolis reawakens - unprotected from an inter-dimensional team of assassins sent to destroy it. Aided by Shandar s caretaker PRIME, George and Lori must find a way to stop the death squad and restore power to the city before it uncontrollably expands to its normal size - annihilating itself and everything around it. Mischievous Messy Magical They re the Goobers! Squidgy, Blop and Esmerelda are peculiar creatures that pose as puppets on a popular kiddy program by day, kept against their will by the TV show s corrupt host, Cap n Mike. Tommy and Susie, the co-starring kids, are the Goobers only hope for freedom but a powerful being has arrived from another dimension with evil plans of her own for the supernatural stars!